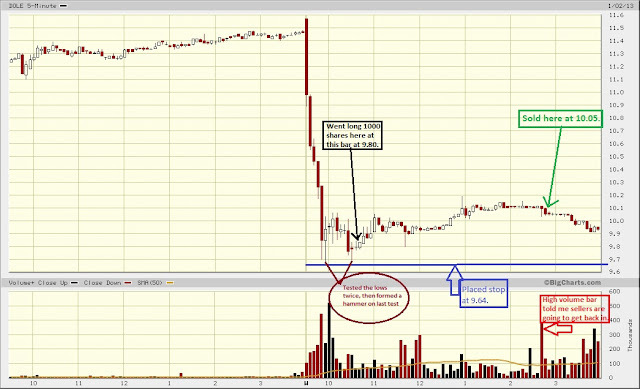 TRADER 9: Trade of the day, DOLE!!! Thought my trade of the day was going to be on UVXY, but the stock started slowly dipping during the day, and got stopped-out after I moved my stop to breakeven. DOLE was pretty much a simple play on a somewhat double bottom move upwards. I went long 1000 shares at 9.80 after a hammer formed where it tested the lows of the day for the second time. The stock started consolidating but failed to move any higher, so I decided to sell it after getting a hint ( higher volume bar on pic) of weakness in the consolidation period at 10.05 for a .25 point gain.